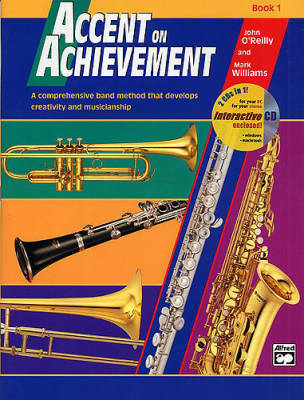 The Accent on Achievement method teaches your band all the fundamentals for a solid musical background. While the student books are designed for learning in a band class, each of the books contains material specifically geared towards each individual instrument. Every few pages you'll find the phrase "Accent on". These are specialized technical exercises designed to address the specific technical problems for each instrument. With the exception of the percussion book, no new notes, rhythms or concepts are introduced in these exercises so that materials previously learned can be effectively reinforced. For additional drills, pages 42-43 of each student book contain expanded technical exercises including alternate fingerings and slide positions. Each book also contains a solo with piano accompaniment suitable for performance at concerts, recitals or festivals. The Oboe and French Horn books contain extra optional lessons which are arranged in a more comfortable range of the instrument. These lessons can be used outside of regular band rehearsal to help students to play with more confidence. Music theory is included throughout the student books. Exercises are at the bottom of every few pages in each of the student books. You'll find them strategically placed to reinforce concepts taught while playing the instrument. Students are drilled on note recognition, fingerings, rhythms and more!